DAVIS—After highlighting a list of critical issues facing native American churches, Indian Falls Creek (IFC) Executive Director Victor Cope and Baptist General Convention of Oklahoma (BGCO) Native American Specialist Emerson Falls exhorted a group of some 200 of their counterparts attending a special meeting July 27 to “Do Something” about the situation. “We are the solution,” Falls exclaimed to the group meeting in the Raymond A. Young Tabernacle at Falls Creek Baptist Conference Center. Cope earlier asked those present to stand as he read a list of problems if that problem was prevalent in their church. Those plights included a church withoaut a pastor (51 in Oklahoma), aging pastors (average age is 55), churches struggling to keep doors open, no visitation/outreach, no revival or Vacation Bible School in years, volunteers burned out, facilities need repair, senior adults the largest group, baptisms down/no baptisms this year and fearful your church will close. When he was finished, more than two-thirds of those present were on their feet. Falls said he and a statewide leadership team met in May and have organized an Aug. 14-15 vision tour of Western Oklahoma, which he called the area of greatest need for Indian work. He outlined a goal of planting five new churches in that area. He added that the leadership team is developing practical “continuing education” courses for Native American pastors and other leaders, and has set up a “Project Timothy,”—that began even the week of IFC—to help those who have accepted the call from God into ministry to begin developing themselves to pursue that divine call. Falls encouraged those present to take the next step to become mission sending churches and to help plant churches. BGCO Executive Director-Treasurer Anthony Jordan was also present, and affirmed that the BGCO and non-native churches support their Native brothers and sisters in their work. In an interview session with Falls, he explained how the BGCO facilitates ministry with its 1,800 affiliated churches and how the Cooperative Program suppports God’s work in Oklahoma, North America and around the world. “I have always had a huge heart for Native American ministry,” Jordan said, “And, we need to plant new types of churches to reach millennial Native Americans who no longer live in the rural areas of Oklahoma. They now live in the cities, and we must do all we can to reach them with the Gospel. At the conclusion of the special meeting, Cope asked anyone who felt called by God to pastor one of the pastorless churches to come to the front of the tabernacle. Seven men responded to the call, to the applause of the crowd. Also, 11 women surrendered to Christian ministry as well. To conclude the event, Cope led all of those present in prayer as they knelt before the Lord on their knees in thanksgiving. 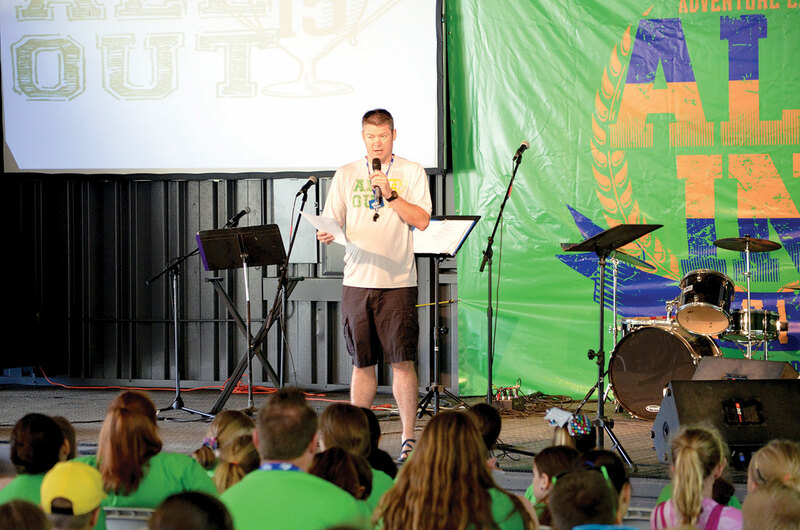 (See more coverage of Indian Falls Creek in the Aug. 13 issue of the Baptist Messenger).